Ibrox Noise: Surprise at Ibrox - have Rangers just saved £3M+? Surprise at Ibrox - have Rangers just saved £3M+? 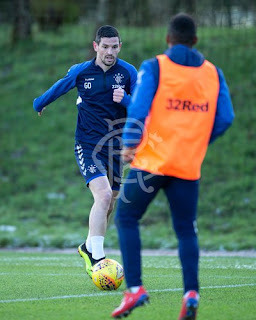 Steven Gerrard’s Rangers have been given a hugely unexpected boost with the return ahead of schedule to training of attacking midfielder Graham Dorrans. After all our chat about the need for an AM, while his fitness isn’t exactly the most reliable, the restoration of the ex-Norwich man to full training is a brilliant fillip for Dorrans and we deeply hope this is finally the end of his absolute injury nightmare of recent years. His cameo in Spain, which we’ve rambled on ad-nauseam about, showed in only 15 minutes just what the former Scotland international can offer. He’s the very definition of a lockpick, able to see things other players don’t and superb with the ball at his feet too – the one thing he cannot sustain is fitness and it’s stopped his career going to the very top. There is little doubt a fully fit Graham Dorrans could have been a special player for club and country, and if there’s even a hint Rangers could finally get some of his best in the twilight years of his career with his finally having gained fitness, the creativity in midfield issue is certainly solved. It’s a big if though – regular readers will know we have a lot of time for Dorrans if he can just keep his body ticking right, and we are still cautious about this latest return given all the false dawns before. But there’s nothing wrong with hope, right? So who takes a powder to introduce him back into the team. This is were things can get complicated for us. As someone making space for him could spit the dummy out big time and before you know we have unrest in a dressing room that's been close all season. I think it could be the same with Defoe if Alfie is left out. Only my opinion and you al know my take on that lol. I don't get this thing about it being difficult or awkward to leave players out of the team. It's football. A better player comes along he plays. Simple and everyone understands that. We will never progress if we think we can't bring better players into the team. Just read the article where you quote Defoe as just a squad player. Not being funny here mate but we can't afford a luxury player on the cash he is on as a squad player. He will start more games than Alfie for the remainder of the season. Just hope Alfie won't lose plot over this as I would take before Defoe. No chance Morelos will make way for Defoe. Morelos brings so much more to the team. Apart from anything else they are not going to devalue their main player and biggest financial asset by leaving him out of the team. We should Sell Him... He is Past his Best!